Hi-Chew Introduces Upgraded Packaging for Entire Candy Line. 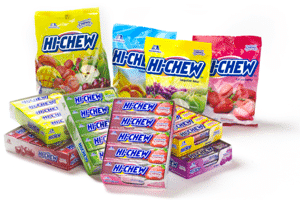 (Irvine, California) February 1, 2016— Morinaga America, the national sales company for HiChew candy, has just revealed all-new packaging for its full line of products. The new bags hold a mix of individually wrapped pieces of Hi-Chew in Strawberry, Green Apple, Mango and Cherry. Hi-Chew stick packages are wrapped in a new foil material which offers a unique sheen. Each stick contains individually wrapped pieces in one of six flavors: Strawberry, Green Apple, Mango, Grape, Cherry, and Banana. There are 10 identical 1.76-ounce sticks per box. The redesigned peg bags feature brighter colors and more vibrant images of the fruit which are blended into Hi-Chew candy in juice form. Regular Mix: Green Apple, Strawberry and Grape. Tropical Mix: Mango, Banana and Melon. To learn more about Hi-Chew, please go to https://www.hi-chew.com, like us at https://www.facebook.com/HiChew/, and follow us at https://www.instagram.com/hichewusa/ and https://twitter.com/hichew.